Bourdain made this Mission liquor store’s multi-layered sandwiches famous, and justifiably so. As a young boy, long before moving out West, I idolized writers and travelers like Kerouac and Hemingway. I stayed up late to sneak episodes of No Reservations with Anthony Bourdain on the Travel Channel. He had tattoos and smoked cigarettes. He ate sweetbreads and fried cheese. He was a rock star. I can still vividly remember watching the episode when he came to San Francisco, walking from Aub Zam Zam to Swan Oyster Depot, House of Prime Rib, and Fisherman’s Wharf. Then he found himself at a liquor store in the Mission that served a sandwich the size of a sofa. I knew someday I was going to try that sandwich, and now I eat it more than I care to admit. That’s It Market on Mission Street between 23rd and 24th streets is just like any other corner store that sells beer, lottery tickets, and Slim Jims. What sets That’s It apart from everywhere else is their tortas. Packed to the crust with different meats and fillings, there is absolutely no other sandwich like this in the Bay Area. For $8.50, the Milanesa comes with breaded beef or chicken, lettuce, tomato, cheese, avocado, jalapeño, sour cream, mayo, and optional beans — and that’s the kid stuff. What I come here for is the real business, the Cubano. I walk through the front door and pull up a seat at a counter with about six stools. In front of me is a large plancha throwing aromas of ham, bacon, and eggs. Laid out are massive loaves of bread, sliced and slathered with crema and queso fresco. And then it arrives. 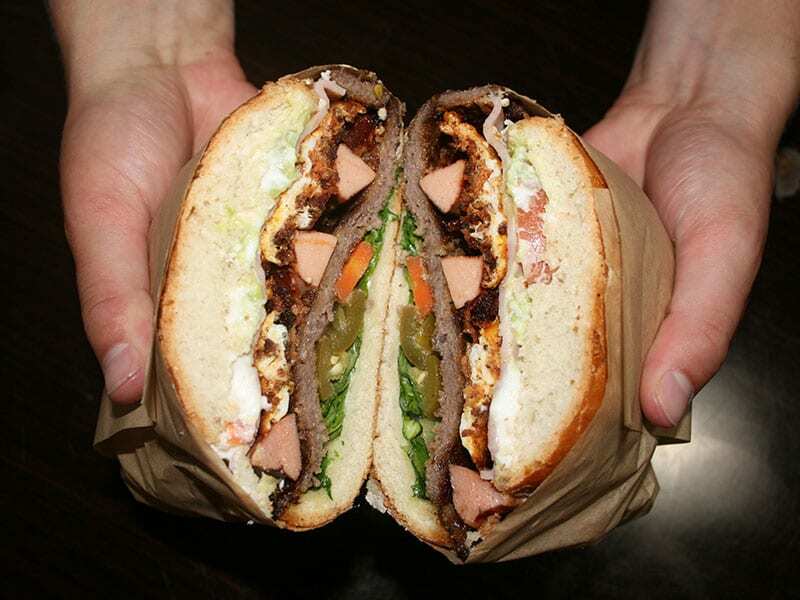 Looking more like the layers of the earth’s mantle and core than those of a sandwich, the Cubano consists of breaded beef or chicken, ham, bacon, chorizo, eggs, hot dogs — yes, hot dogs — lettuce, tomato, cheese, avocado, jalapeño, sour cream, mayo, and those same optional beans. The sheer amount of color and textures that meld together this titan is astonishing. The thing sits about four inches tall and weighs as much as a bag of apples. The meaty layers gel together and ooze into the spicy peppers. The scrambled eggs are smooth and springy, while the queso fresco cools everything down. And as for the hot dogs, they’re just the cherry on this why-the-hell-not sundae. Sitting in a liquor store and tackling a delicious Mexican sandwich on a sunny afternoon is about as San Francisco as it gets. But I’m telling you, do not take this task lightly. If this monster sounds overwhelming to you, you’re right, it is. This is Bourdain territory, folks. This is the big leagues, baby, but if you think you’re game enough, it’s time to step up to the plate. That’s It Market, 2699 Mission St., 415-285-9833, no website.